Mutations in >50 genes can lead to monogenic steroid-resistant nephrotic syndrome (SRNS). 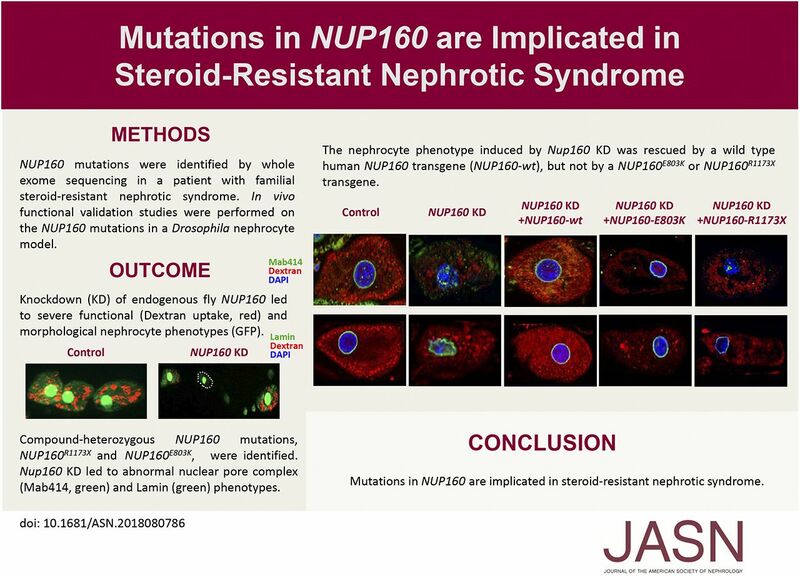 The authors found that a young patient with familial SRNS and FSGS carried novel compound-heterozygous mutations in NUP160; this gene encodes nucleoporin 160 kD, one of the protein components of the nuclear pore complex. Using an in vivo renal cell assay on the basis of Drosophila nephrocytes (an experimental podocyte model previously used to validate candidate renal disease genes and specific patient-derived mutant alleles), they validated the NUP160 gene variants as factors implicated in kidney pathology. The findings indicate that NUP160 should be included in the SRNS diagnostic gene panel to identify additional patients with SRNS carrying homozygous or compound-heterozygous NUP160 mutations. Background Studies have identified mutations in >50 genes that can lead to monogenic steroid-resistant nephrotic syndrome (SRNS). The NUP160 gene, which encodes one of the protein components of the nuclear pore complex nucleoporin 160 kD (Nup160), is expressed in both human and mouse kidney cells. Knockdown of NUP160 impairs mouse podocytes in cell culture. Recently, siblings with SRNS and proteinuria in a nonconsanguineous family were found to carry compound-heterozygous mutations in NUP160. Methods We identified NUP160 mutations by whole-exome and Sanger sequencing of genomic DNA from a young girl with familial SRNS and FSGS who did not carry mutations in other genes known to be associated with SRNS. We performed in vivo functional validation studies on the NUP160 mutations using a Drosophila model. Results We identified two compound-heterozygous NUP160 mutations, NUP160R1173× and NUP160E803K. We showed that silencing of Drosophila NUP160 specifically in nephrocytes (fly renal cells) led to functional abnormalities, reduced cell size and nuclear volume, and disorganized nuclear membrane structure. These defects were completely rescued by expression of the wild-type human NUP160 gene in nephrocytes. By contrast, expression of the NUP160 mutant allele NUP160R1173× completely failed to rescue nephrocyte phenotypes, and mutant allele NUP160E803K rescued only nuclear pore complex and nuclear lamin localization defects. Conclusions Mutations in NUP160 are implicated in SRNS. Our findings indicate that NUP160 should be included in the SRNS diagnostic gene panel to identify additional patients with SRNS and homozygous or compound-heterozygous NUP160 mutations and further strengthen the evidence that NUP160 mutations can cause SRNS.